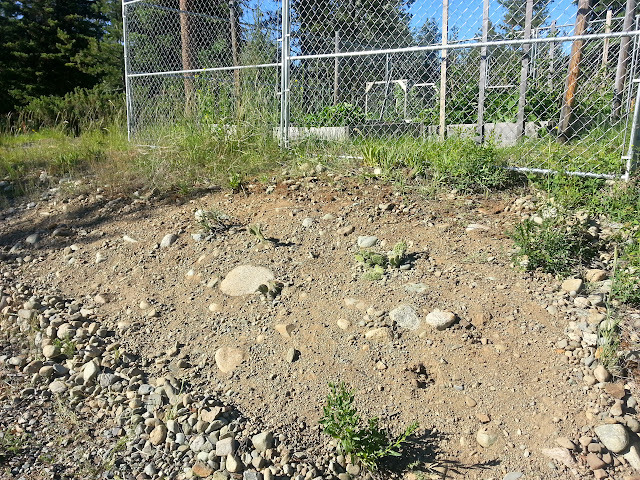 Per my last post, I discovered a fairly steep Southwest-facing bank that soaks in a lot of heat during the day. This site becomes snow-free and dry very early in the Spring, owing to its aspect, steep incline and very rocky, almost soil-free nature. Exploring the site further, and discovering that it is basically a hill of boulders with gritty sand that is virtually devoid of organics, I was reminded of Peter Korn's book "Peter Korn's Garden - Giving Plants What They Want" and his recent presentation to the Alpine Garden Club of BC in Vancouver. 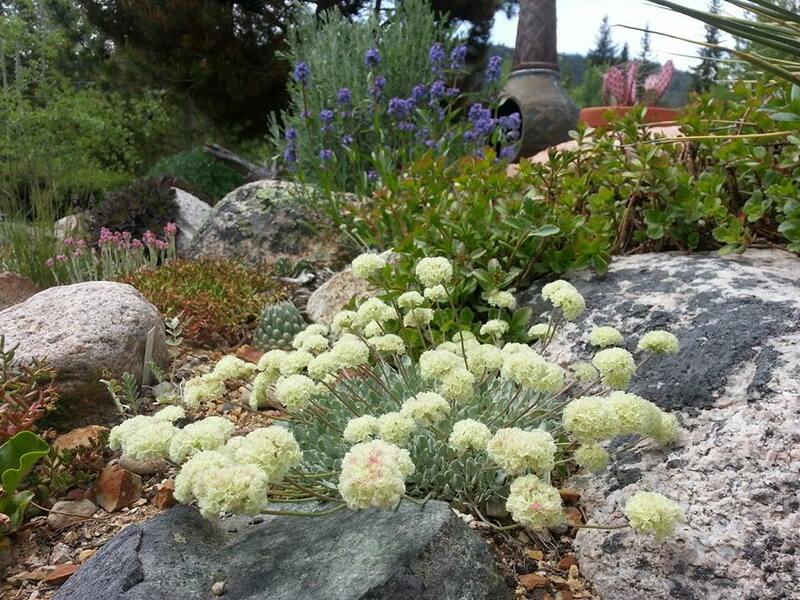 Peter used a steep, rocky slope like this for hardy cacti in his garden, near Gothenburg, Sweden. 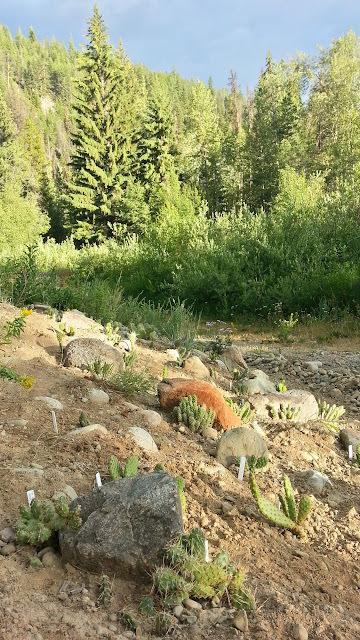 I got to thinking - cacti are probably the ONLY plant I could successfully grow on this incredibly well drained spot, which would be very hot in Summer. 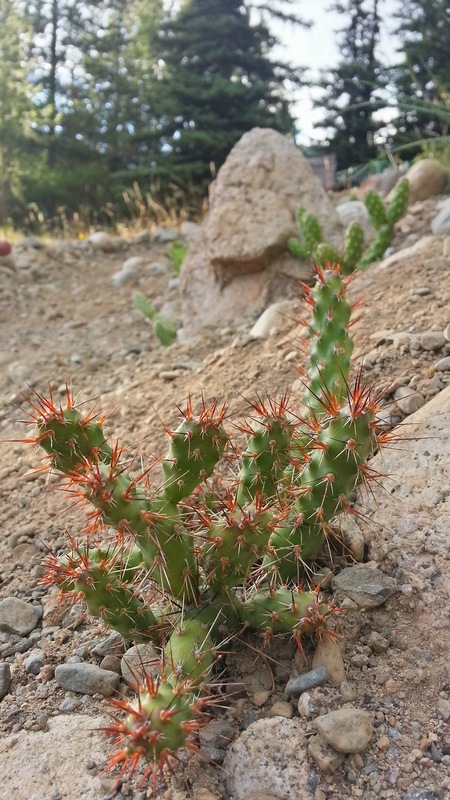 It is not surprising to note that the native Opuntia fragilis hybrids, which live in the valleys at lower elevations, tend to colonize similar rocky hillsides. I chatted with hardy cactus expert and friend Jeff Thompson, and he agreed this site might be my best chance to maximize the number of hardy cacti I can grow. 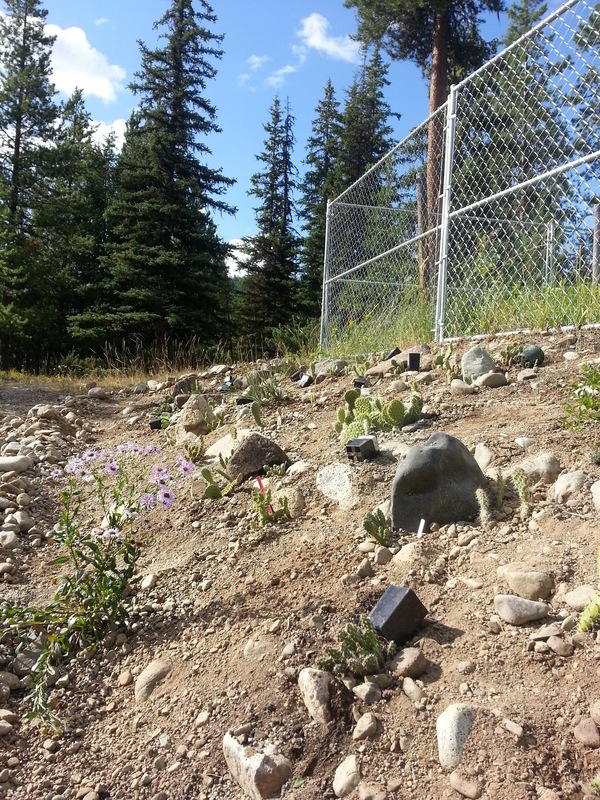 Early in the summer, I did a bit of hardscape work and began planting a large number of Opuntia (prickly pear). Some of them are collections I have made. Others are plants I have obtained in trade. Still others are I have bred and propagated myself over the years, having had some success with Opuntia in the dryland garden I established in 2004. I also threw in a couple of additional cacti - Escobaria vivipara, and one Echinocereus triglochidiatus from NE Utah. 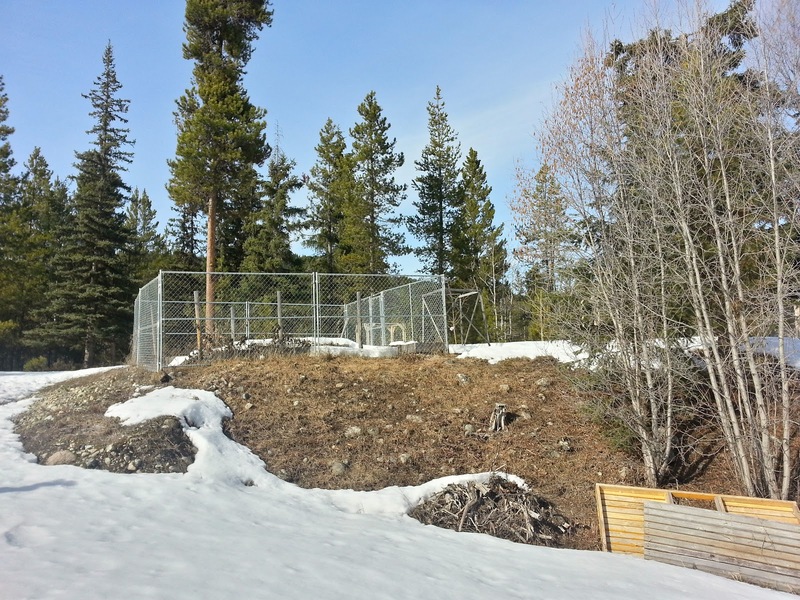 March 8, 2015 - the site in question (on the far left, below the fenced-in garden that contains raised beds my mom grows strawberries and raspberries on) is snow-free and dry WEEKS ahead of other parts of the property. June 8, 2015 - early days. Started clearing the site. 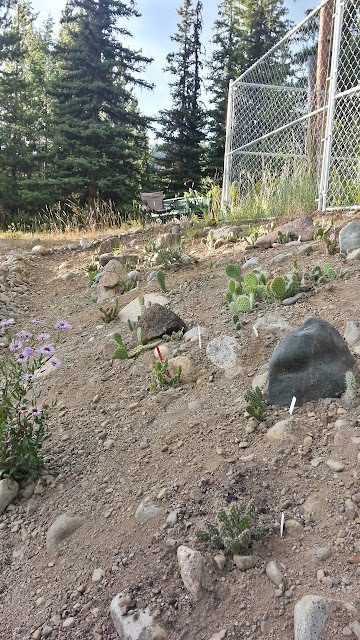 I planted a few Opuntia just to see how it would look. I decided to keep the volunteer Aster conspicuus that appears at the very bottom. It will provide good colour later on. July 13, 2015 - the act of planting. This took a few days. July 16, 2015 - starting to look good now. July 16, 2015 - view to the West, towards Hayes Creek and impending thunderstorms. July 16, 2015 - one more view. 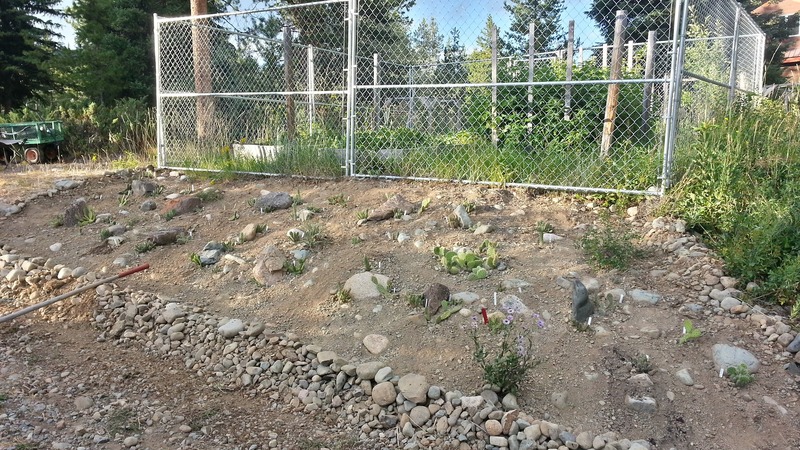 July 16, 2015 - new home for one of my favourites: Opuntia fragilis collected in Idaho.